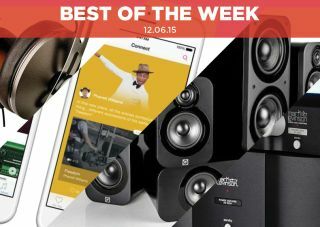 Best of the Week: Apple Music, Q Acoustics surround package, Sennheiser headphones and more | What Hi-Fi? This week was the big one from Apple. At the WWDC event the company took the covers off its 'Spotify killer' in Apple Music and Spotify responded by reporting new figures about its userbase. Onkyo revealed a number of home cinema products that'll be incorporating Dolby Atmos, and BT Sports announced its new Ultra HD channel to go with its acquisition of Champions League and Europa League football. Reviews-wise we saw Sennheisers's wonderful Momentum 2.0s, Mark Levinson's effortless 326H/532S pre/power combo and Q Acoustics' 3000 5.1 Series Cinema Pack all get five stars. And don't forget the new issue of What Hi-Fi? Sound and Vision is now on sale, packed with the latest in home cinema and hi-fi. The latest issue features bargain 4K TVs, budget surround sound packages and a review of music streaming sites such as Spotify, Qobuz, Deezer and others. It's been in the pipeline for what feels like an eternity, but earlier this week Apple made their music streaming service official. Apple plans to launch the service later this month (30th June), with users treated to a three-month trial before being charged £9.99 a month. A family package, with up to six accounts, is priced at £14.99. Features at launch include what Apple claims is the first "24/7 radio station" in Beats 1 Radio, Apple Music Connect, which is designed to bring fans closer together with artists, as well as curated content from a number of partners including Q Magazine and Pitchfork. MORE: Apple Music on Sonos will be "when Apple is ready"
BT took control of the rights to Champions League and Europa League football and it'll be the only place to see them in 4K. The telecomms giant announced it will be launching an Ultra HD channel, set to go live on 1st August. A new YouView+ Ultra HD box with 1TB hard drive made by Humax is also on its way . So if you want see and hear Michael Owen and Robbie Savage drone on in Ultra HD, you know where to go (though we prefer James Richardson). Onkyo has aggressively adopted Dolby Atmos into its range of AV receivers, and this week brought more news of Atmos-enabled products. There's another budget Atmos receiver – the TX-SR444 – at £350: the HT-S5805 5.1.2 all-in-one Atmos surround package, yours for £700, or you could buy the SKS-HT588 speaker package (£450) on its own and use it with any Atmos-enabled receiver. After Apple fired off a shot with its Apple Music announcement, Spotify has responded in kind with updated figures for its service. In May 2014 the company reported 10 million subscribers and 40 million users. Those figures now stand at 20 million subscribers and 75 million active users. Though Apple Music could blow it out of the water through its reported user base of 800 million iTunes accounts, Spotify has upped its funding, raising $526 million to compete. It also announced that it has paid more than $3 billion in royalties to artists. Chew on that Taylor Swift. "Q Acoustics’ latest continues the company tradition of punching way above its weight"
Q Acoustics stormed the test rooms with its 3020 standmount and 3050 floorstanders, both earning five stars earlier this year. Now it's the turn of its 3000 Series 5.1 Cinema Pack, and once again Q Acoustics offers stellar value for the money. The sound hovers somewhere around providing excitement and refinement with plenty of nuanced detail. Play it with the latest Hollywood blockbusters and the level of organisation and precision matches, if not betters, that of its rivals. The subwoofer sounds a little soft to our ears, but that's a small issue in light of what the package offers. Q Acoustics has done it again. This is a great budget surround sound package. "They’ve retained their looks, but now boast extra portability and improved sound quality"
Sennheiser's Momentum range has yielded plenty of great headphones. We've had the Momentum On-ears, M2 IEis and the Momentum 2.0 Wireless cross our desks and we've barely had a bad word to say about them. The Momentum 2.0 picks the baton up and runs away with a brilliant performance. Clarity is excellent, timing is expertly done and the balance across the ranges is pretty stunning. Sennheiser has offered up a gorgeous, brilliant sounding pair of headphones. They do not disappoint. "Even with the music at its most challenging, this ML pairing sounds totally unflustered"
It's another pre/power combination, this time from Mark Levinson. Levinson can be considered as being part of the high-end group; at £16,800 the 326S/532H pre/power is actually one of its more affordable pieces of kit. Eye-watering prices aside, what you get is a talented pairing that oozes refinement and composure. Throw any challenging piece of music at it and the Levinson handles it, making tricky tracks look effortless. Run them in for a few days and you'll find that this is a cracking pre/power. Terrific.